Final entries at EPT Barcelona pushed the field to 1,785, and Nicolas Chouity bagged the chip lead. Day 2 of the record-breaking 2016 PokerStars.es European Poker Tour Season 13 Barcelona €5,300 Main Event saw more than 900 players return to the Casino Barcelona and another 28 hopefuls opted to buy in with a fresh stack of 30 big blinds. This boosted the overall attendance to 1,785 entries, and the prize pool of €8,657,250 was to be shared among the top 359 spots. The minimum cash is worth €5,630, while the winner walks home with a life-changing payday of €1,122,800. Fewer than 295 hopefuls advanced to Day 2 after six 75-minute levels and EPT6 Grand Final champion Nicolas Chouity claimed the lead with impressive 559,000. He is closely followed by Austria's Adem Marjanovic (542,500) and Uri Reichenstein (518,000) also put more than half a million into his bag. Other big stacks and notables for Day 3 include Georgios Zisimopoulos (462,000), Martin Kabrhel (458,500), aforementioned Alin Grasu (437,000); Gleb Tremzin (428,000), and Diego Zeiter (383,500). Before the cards went back underway, the EPT's Neil Johnson announced news about the expansion of the PokerStars brand on the live circuit with the PokerStars Championship and PokerStars Festival series at various old and new destinations such as Macau, Atlantic City and Barcelona — promising more games, more days and more events. Once play resumed, the call of seat open came in steady and at a frantic pace. Paul Hoefer lost with ace-queen to the pocket queens of fellow German Julian Stuer, while Xuan Liu turned two pair and ran into the slowplayed set of aces by Wael Sarkis. Former PokerStars Caribbean Adventure champion Dominik Panka got three-outed by Alexander Lakhov and German wunderkind Fedor Holz, who won the €50,000 Super High Roller a few days ago, lost with top pair to an overpair. Bertrand "ElkY" Grospellier, Yaxi Zhu, Janne "Savjz" Mikkonen, Leo Fernandez, Theo Jorgensen, George Danzer and defending champ John Juanda all fell before the money. Alexandros Kolonias and Jeremy Nock put their hopes on spades, but Adem Marjanovic had tens for the overpair to hold up and join the big stacks. At almost the same time, Niall Farrell played a huge pot with ace-king and Alin Grasu looked him up with queens to bust the EPT12 Malta winner. Other former EPT champions to join the rail before the money included David Vamplew, Oleksii Khoroshenin, Dzmitry Urbanovich, Michael Tureniec, and Steve O'Dwyer. In the last few seasons, the money was usually reached in the first few levels of Day 3, however, thanks to the new 20 percent payout structure, the bubble in fact burst in the middle of Level 14. Yann Pineau emerged as bubble boy after calling all in with a pair of tens on a board of only to see Neculai Macovei turn over a full house with five-three. 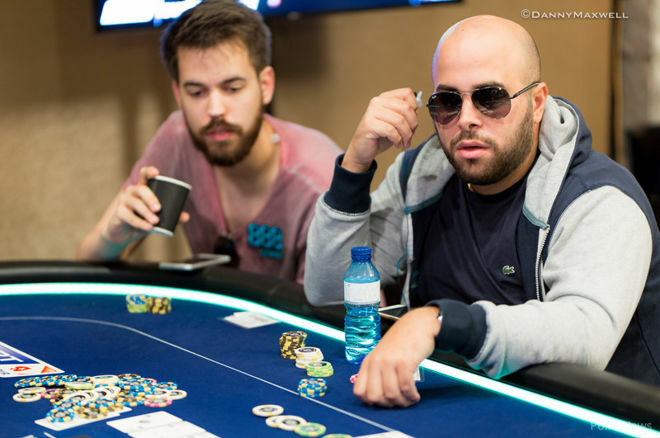 More than 60 players were eliminated in the money in the last half hour, including Fatima Moreira de Melo, Maria Lampropulos, Chris Moorman, Pablo Gordillo and Ivan "negriin" Luca. Team PokerStars is represented by the Team Pros Jake Cody (284,500), Jason Mercier (266,500) and Felipe Ramos (63,000), while Team Online's Mikhail Shalamov ran pretty well and bagged up 377,500. Other EPT champions through to Day 3 were Michael Eiler (167,500), Mike McDonald (124,000), Ronny Kaiser (99,600), Dimitar Danchev (80,000) and Davidi Kitai (57,000). The 2016 November Niner Vojtech Ruzicka will return with 72,000. Action resumes Thursday at noon local time when another five levels of 90 minutes each are scheduled. The full chip counts after Day 2 and redraw for Day 3 will be published as soon as the PokerNews live reporting team receives them.